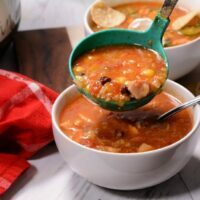 Here you have an Instant Pot chicken fajita soup that will be the perfect soup to serve up this winter. Add in rice or skip the rice for a Weight Watchers friendly recipe. 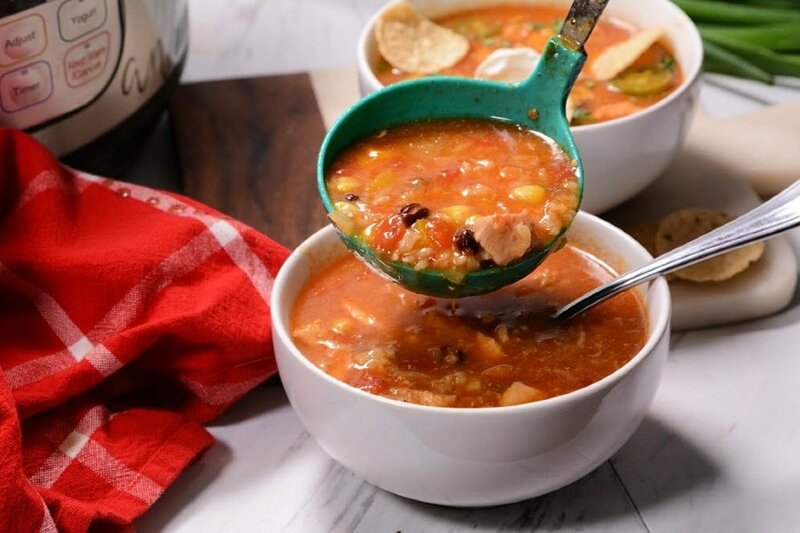 You have tender pieces of shredded chicken, beans, corn, and more for one Tex-Mex soup that you will all fall in love with. The snow has arrived so that means I pull out all my top soup recipes to fill us up and keep us nice and cozy during these cold and chilly snow days. 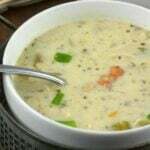 This soup was a new recipe that we tried out and I have to say it became an instant favorite. What I love is if you are on Weight Watchers, just leave the rice out and it is WW friendly. Or maybe you want it to be a little heartier, then add in the rice. I have made it both ways and both are outstanding. 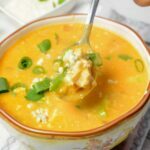 Grab some avocado, sour cream, shredded cheese and top your soup for even more elements of texture and flavor. 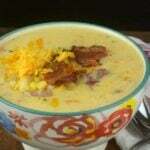 Or eat the soup alone, either way, it is a winner dish for sure. I wanted to cook this in my Instant Pot because you all know I love that slow-simmered taste that the electric pressure does in a fraction of the time. You all know by now I love to cook and test out new recipes. I also like to create recipes that real people will enjoy. I like to classify this soup as an “empty out your fridge and pantry” type of soup. I grab my supplies and I am ready to start cooking in a hurry. You might find all the ingredients right in your fridge, freezer, or pantry! So, if you like simple recipes that carry the flavor factor that makes you swoon over the flavors, this recipe IS IT! Trust me, you guys, give it a go. It can be a struggle getting that dinner to your table, and that means meal planning can save the day! I have created many meal planning sets that use the Instant Pot to where you can grab supplies from the store and follow the calendar as to what to make. This is a great starter to find meals to work for you and your family. Sometimes a little guidance like a meal planner can help give you the kickstart to getting your dinners to the table easily and fast. I can handle all the busy work, and you just pick up ingredients and turn that Instant Pot on! 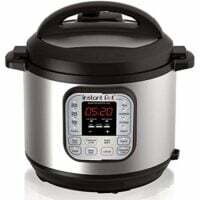 I reach for my Instant Pot because it cuts out kitchen cook times, so I don’t have to spend as much time in the kitchen. I can spend it creating fun new recipes with my cousin, watching the snow fall, or curled up relaxing watching a good show. Dinner doesn’t have to be a chore, make it fun with new recipes! 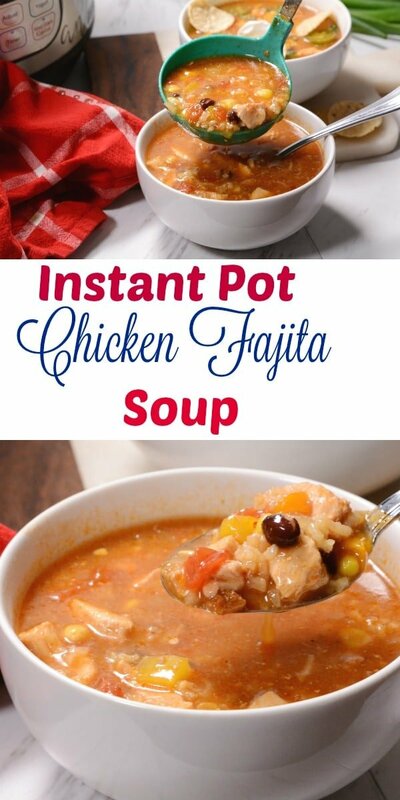 Here you have an Instant Pot chicken fajita soup that will be the perfect soup to serve up this winter. Add Broth, Tomatoes, Beans, corn, Rice, and all seasonings. Outrageous good! I made 1/2 the recipe and still had almost 8 cups of soup. I’m making again this week for a church dinner. Hmmmmm……The instructions does not mention how long to place pot on saut’e. Do you not pressure cook it at all?